New York, NY: Ridge Press Book/Random House, 1972. 1st Stated Print. Orig owners book stamp impressed inside front. Hardbound. 4to. 251 Pgs.. Fine in Chipped DJ/Good. Stanley Rosenfeld. The Sailor's World published by Ridge Press Book/Random House, New York, NY, 1972. 1st Stated Printing. Hardbound, Paper DJ. Size 4to (up to 12'' tall). Condition: Fine in Chipped DJ. Orig owners book stamp impressed inside front. 251 Pgs. ISBN 039446852X. LCCN 78-183593. Photography by Stanley Rosenfeld. 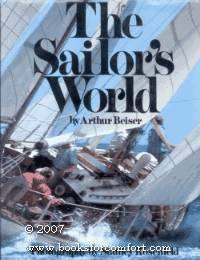 In this beautifully illustrated book, Arthur Beiser - author, scientist, and journeyman sailor aspiring to mastery - explores the universal qualities of the sailor's world. Perceptively and unsentimentally, he seeks out the essence of sailing - the personal values that underlie every sailor's awareness of his place in the unique environment of sails and wind, hull and water. Description text copyright 2007 www.BooksForComfort.com. Item ID 14504. Format/binding:Orig owners book stamp impressed inside front. Hardbound. 4to. 251 Pgs.